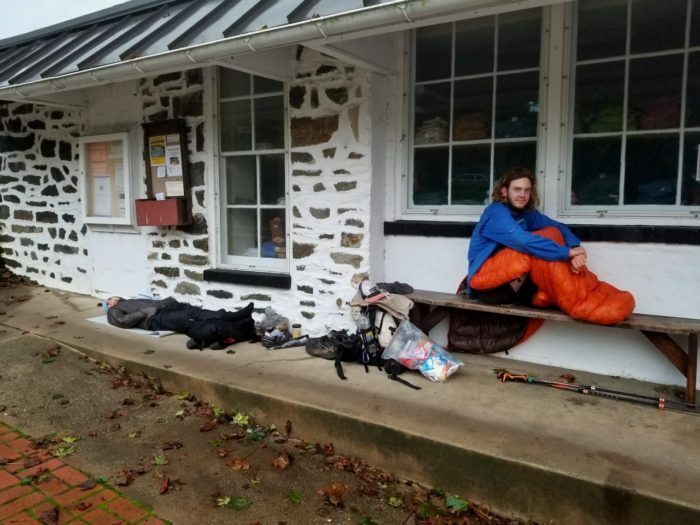 The following will describe my experience as well as provide an additional five tips that may aid you in the Maryland Challenge if you ever choose to do so. 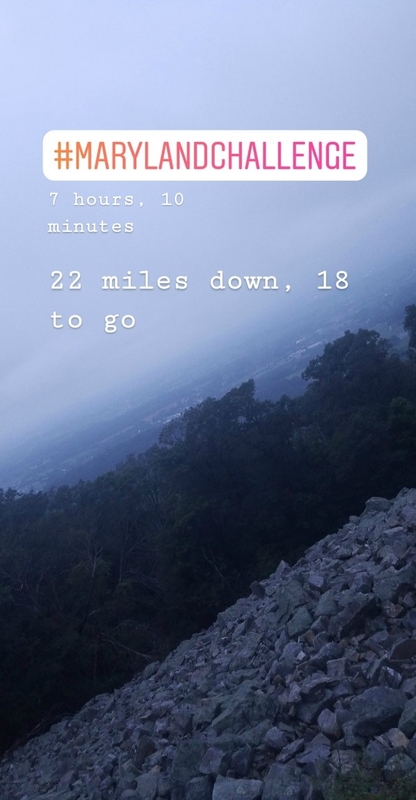 Maryland hosts only 41 miles of Appalachian Trail, so a crazy person somewhere had the brilliant idea of making it a thing to walk across the state in one day—24 hours. For anyone who doesn’t know of the Maryland Challenge previous to this, just a heads up—this is a very backward way to do it. So if you’re planning on attempting it, do as I say, not as I do. As of 10 a.m., the bridge preventing us from doing the Maryland challenge had apparently opened back up. 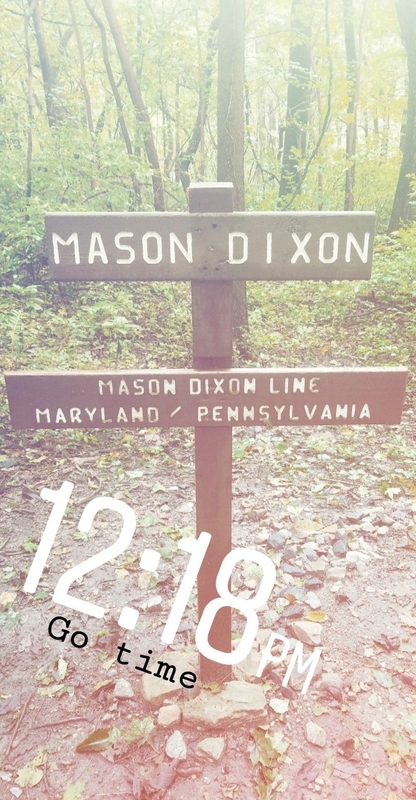 I passed the information on to the guys, hitched back to the road where I entered the trail again, and met them at the Pennsylvania/Maryland border, also known as the Mason-Dixon Line. I had this whole plan to sleep there, or anywhere, then start the Maryland Challenge at 2 a.m. the following morning. As most plans go out here (not according to plan), we crossed the line right there and then at noon, looking back at Pennsylvania one last time before committing to the next 41 miles, all in one go. At 12:18 p.m. we crossed the line. In the obsessive phase the world is going through surrounding Instagram, it was only natural that I post a story for everyone to see. Therefore, my first tip is one I actually did right. Post Your Challenge On Some Sort of Social Media Platform. It wasn’t until a few hours in when Dreamer confessed he was quite content with quitting and sleeping like a normal person in a shelter along the way. It was game over for him, though, when I put the challenge on social media and it was known that he was participating. So ha, that meant we all had to finish what we started. We started at a fast pace and powered through 22 miles in seven hours. It felt like we were flying and invincible at this point. 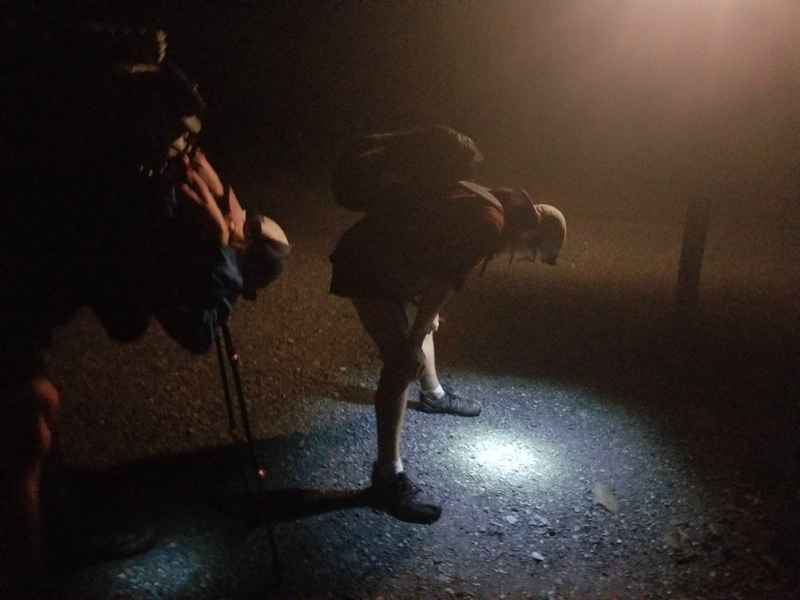 We set a 20-minute time limit for a break, which I doubled, because I must confess that though my feet were fine, my stomach hated me. It had been growling for at least seven miles and looking for food that was inaccessible so long as I was walking. Tip number two coming at you: Make Sensible Food Choices. While we knew the bridge was impassable, Sun Chaser connected with a family friend and arranged for her to pick us up in not 42, but ten miles so we could wait out the hurricane. That meant my Walmart resupply was done thinking I was only walking ten leisurely miles. The guys seem to subsist on granola bars on a normal day so it worked out for them, on top of their genius stash of caffeine pills. I would recommend food that can be reached without taking your pack off, which you can stuff in the front, side, or anywhere outside, really. Lightweight but high in nutrition or calories is probably your best bet; bars, dried fruit, and more bars. There are so many different bars I must strongly suggest you try Truth Bars, or RXBARs, because they’ve been rocking my socks lately and as of two weeks in I stopped being able to stomach Clif Bars, meaning I’ve basically tried every kind out there about now. Dreamer and Sun Chaser, just five miles in. By some miracle I managed to make it through Maryland alive without sensible food choices. I carried the heaviest of snacks; two apples, a banana, and a bag of carrots, which were not fun to carry. For the break we took—22 miles in—I actually cooked quinoa and made hot coffee, which is reasonable for disregarding the time limit we set, but man, until then I was deliriously hungry and drained of energy. Our break was at the Washington Monument (not the one in DC) and from there we had a lovely view of some city lights. It was our only view. We had been walking under tree cover and not come out to any viewpoints until then, so the sight was welcome. People claim Maryland has nothing really to offer so I didn’t feel so badly blowing through it. It apparently does have a couple of decent sights so that brings me to number three: Start Hiking at a Reasonable Time. Break time at the Washington Monument. Eyes are for seeing, and everyone knows you can’t see in the dark, so a reasonable time to start would be dawn. Yes, a very logical thought that I probably don’t need to mention. Depending on your pace, you may be able to get away with walking in all daylight hours. 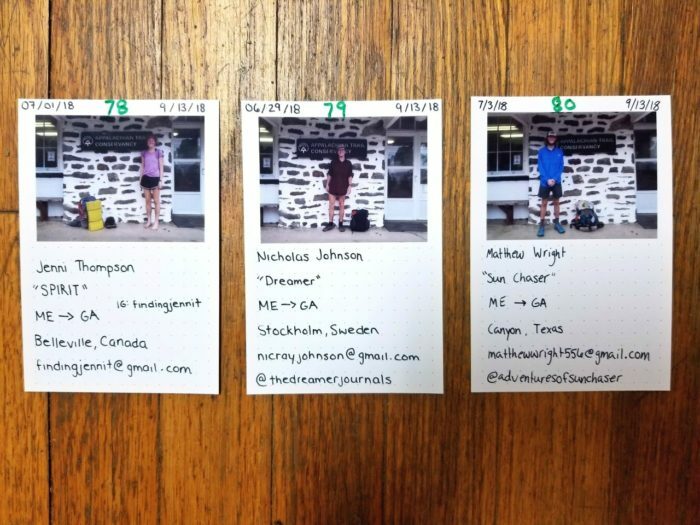 It took us 14 hours, 38 minutes—half of which was in pitch black surrounded by a ghostly fog. It’s no secret to anyone following my blog that I hate night hiking and am absolutely terrified when I’m caught out in the dark on trail alone, so point number four: Buy a Headlight You Can Trust. It’s no fun to trip, and even less fun to trip in the dark. I did not fall, sorry to disappoint, but my falling days are hopefully behind me now. I think the last one was in Massachusetts. Anyway, the dark scares me, blah blah blah. I was using a clunky cheap one from Walmart that had apparently no battery left. I’ve come to know headlamps are a necessity on the trail, and I’ve gotten over the ridiculousness of feeling like I’m mining for gold or whatever, but to be wearing one that doesn’t actually work surrounded by animals, branches falling, hurricane warnings, and rocks to trip on was something I’m not in any hurry to experience ever again. Dreamer had the best light so I was panicking to keep up in order to get some aid from that, while Sun Chaser was doing OK with his. 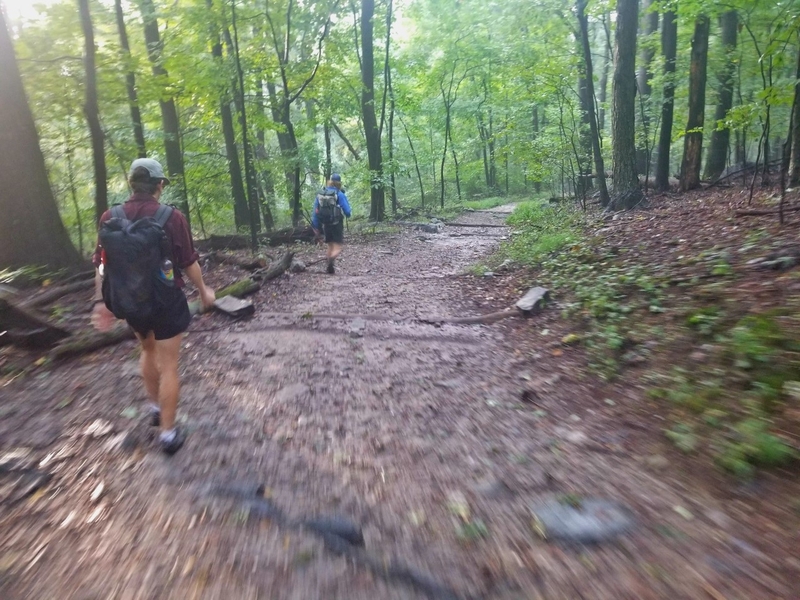 I thought my head was going to explode quite a few times from focusing so hard on each step and where the trail was, and I was a nervous wreck anytime I was more than 20 feet from either of them, but I made it. I’m sitting here safely in Virginia with a brand new headlamp. It doesn’t mean I enjoy night hiking any more, but I do feel weirdly safer with it. Anyway, splurging on a better headlamp was the best thing I could’ve done back then. The last ten miles were where it got hard for me. Energy was low but we had still been walking at a steady pace. Then we hit the descent. I’m normally a big fan of them but now I felt my body was broken and having to make it walk in a downward motion for a few miles was too much. Then the flat section came. Three miles of sharing the bike path lane followed by a bridge across the Potomac River signified the entrance to West Virginia—more importantly, the end of Maryland! Before we end, let me just give you my last tip: Wear Appropriate Footwear! RIP Adidas. You only destroyed my pinky toes for life. This isn’t really a Maryland-challenge-only-recommendation, more like a rule to live by. If they’ve got holes in them and make your feet wish they were not attached to your body then it’s probably time to throw them away. 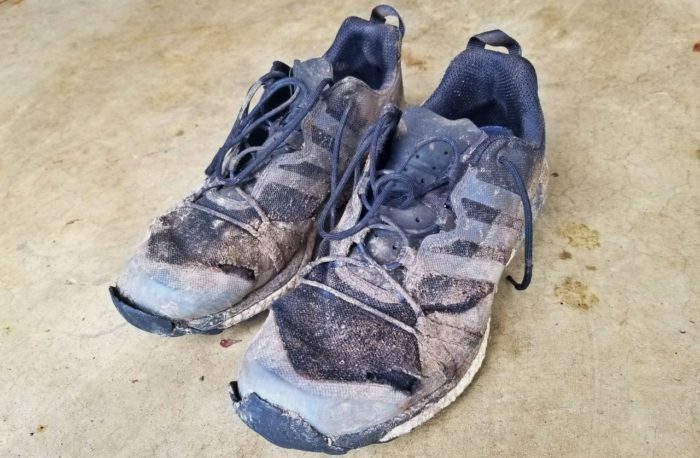 With four holes on my clearance pair of Adidas I picked up 560 miles previously, they carried me through it, but oh so painfully. Sun Chaser had duct tape covering blisters on blisters and Dreamer was wearing shoes he knew had no cushioning before purchasing (why, Dreamer, why?) and to top it off, the rocks in Pennsylvania didn’t end in Maryland, nope. Shoes out here generally last 500 miles and I’m happy to say that once these shoes got me to the finish line—they never went back on. They went into the garbage and I walked away with a used pair of shoes I found in a hiker box at the Appalachian Trail Conservancy (ATC) that were already worn in for me. Gross, maybe, but free trumps gross out here. 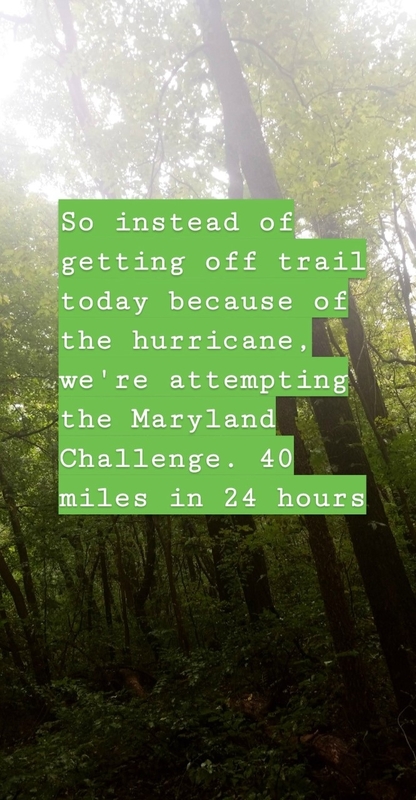 Did we even successfully do the Maryland challenge? We completed it yes, but how successful was it really? It was a type two kind of fun. The kind where Dreamer refused to admit he was happy to have done it for a very long time afterward and cursed me for posting the challenge commencement on Instagram. Sun Chaser and Dreamer at the finish line. That was my tale of my 46-mile day (including miles in Pennsylvania I’d done)… 14 hours, 38 minutes. We broke out into Take Me Home, Country Roads when we crossed that West Virginia border. 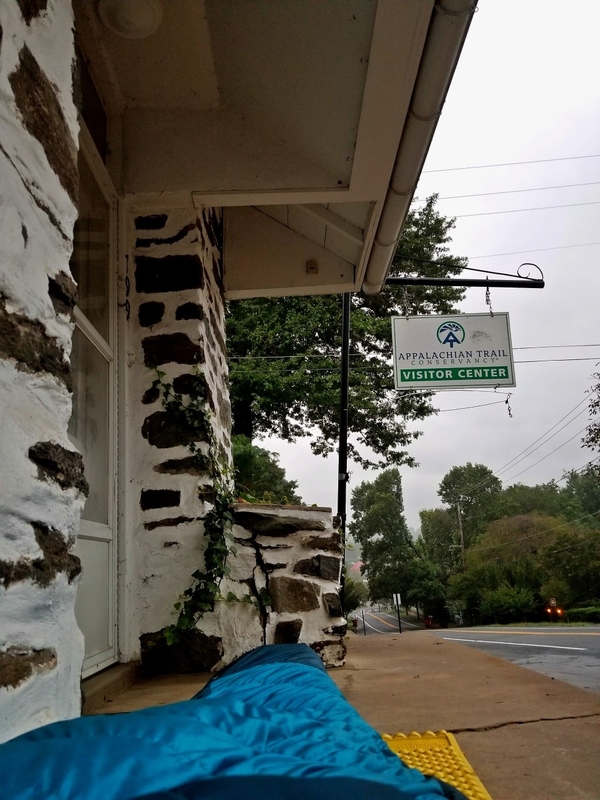 It was 3 a.m. when we rolled up to the ATC building in Harpers Ferry with nothing on our minds but sleep and bodily pain so we crashed right there on the porch outside, cars zooming by but no cares given. 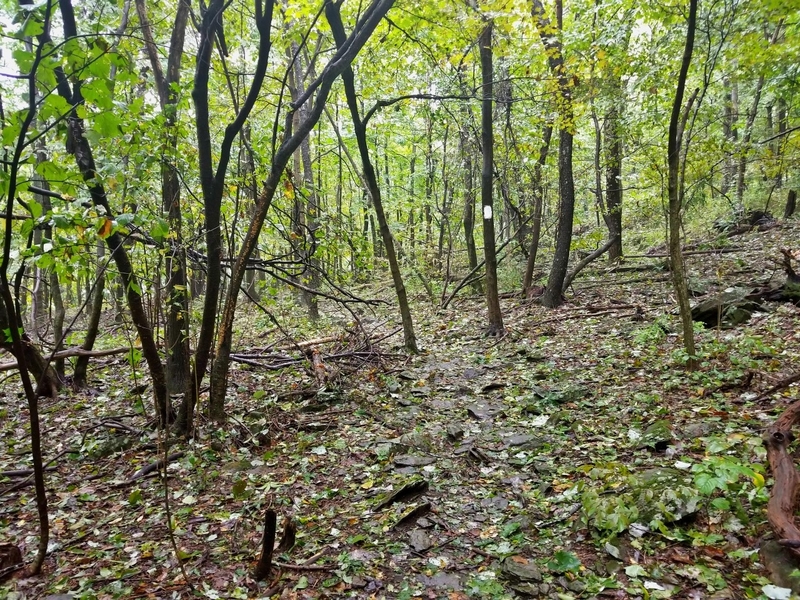 We registered as the 78th, 79th, and 80th SOBOs of the season only to be told the trail south of there was closed due to Hurricane Florence. Voila, perfect timing. I’ll end with a quote from Sun Chaser at 3 a.m. upon arriving at the ATC porch. Dreamer still asleep looking not comfortable, and Sun Chaser not happy to be awake. Congrats on completing the Challenge! Happy Trails!